William Holden. What can one say exactly? Sure, just looking at him he’s quite the looker but go beyond that and look into his eyes, you’ll see so much more. William Holden was a different kind of leading man. His characters were flawed, passionate, cynical but he could also be charming, funny, and sensitive. Holden took risks in his more than 40 year career because he wasn’t afraid of showing the good, the bad, and the ugly. 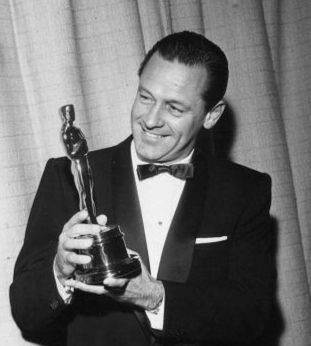 Holden received his only Oscar in 1953 for his role in Billy Wilder’s “Stalag 17.” His Oscar acceptance speech is the shortest on record with a simple, “thank you.” There’s been a bit of a debate about his win. Some believe the Academy gave it to him as a “forgive us” gesture for not awarding him three years earlier for his breakthrough performance in “Sunset Blvd.” Legend has it that even Holden’s own wife, Ardis Ankerson, shared this sentiment. While Holden’s performance is nothing short of phenomenal in “Sunset Blvd” because up until then it was unlike anything he had done on film, but in “Stalag 17” he takes his talents to a whole other level. Comparing the two is apples to oranges (and that’s not the point of this post); both are two very different films but both films help cement the legacy of William Holden. 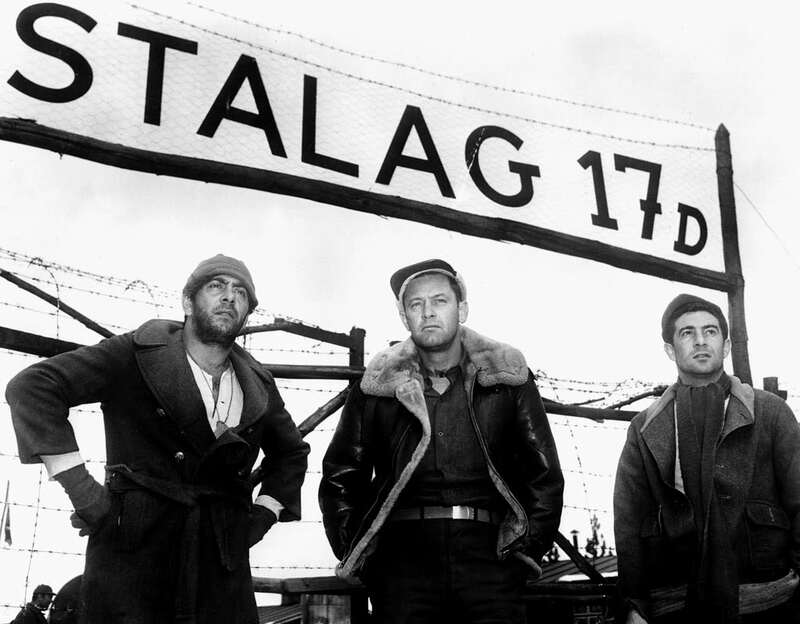 Stalag 17 is an interesting picture. On the surface it’s a comedy set in a POW camp in WWII, not exactly the ideal place for laughs but trust me, it works. It’s directed by Billy Wilder. Is there any other director who blended comedy with the hardships of real life as seamlessly as he did? Wilder creates a masterpiece that’s part melodrama/part comedy/part thriller. The film is basically about a group of American prisoners who suspect that one in their barracks is a traitor. Holden stars as Sgt. J.J. Sefton, the film’s anti-hero protagonist. In the beginning, Sefton comes off as selfish and arrogant because he’s the loner in the camp with all the goodies but what the audience doesn’t realize is that this character has many layers to him. Sefton is gruff, cynical, and has no interest in escaping the camp. He’d rather wait for the war to be over and collect cigarettes and other luxuries by hustling. As the film goes on, you never really know where Sefton stands until the climax but that’s the beauty of it. There’s no redeeming monologue or situation in which he emerges as a good guy. Because of the story and the performance the audience sees his bravery and then it hits you, he really is a hero. Often times flawed characters need that one bright, shining moment where the character redeems his/herself but here it doesn’t happen yet you love Sefton anyway. It takes a good script to achieve that but it also takes a good actor to bring it to the audience. From Here to Eternity” but it’s hard for me to single them out in that film because I always found it to be “ensemble heavy.” Holden in “Stalag 17” carries the film and elevates it. Yes, there are more colorful characters peppered throughout the film and Holden is in the back sometimes but he helps set the tone to make “Stalag 17” work. That’s what a “Lead Actor” should do and boy did Holden do it well. 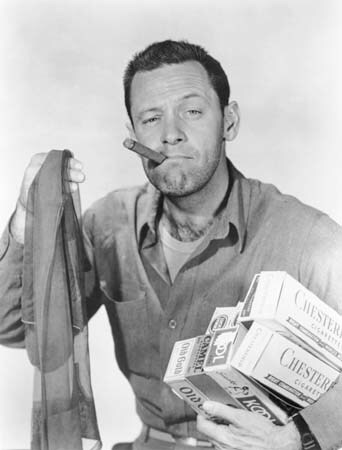 The funny thing about “Stalag 17” is that William Holden did not want to do the project. Holden apparently didn’t like the character of Sefton but Billy Wilder saw the character in him. Holden went to see the play and walked out at the end of the first half. It’s been said that the studios actually forced Holden to take the part. 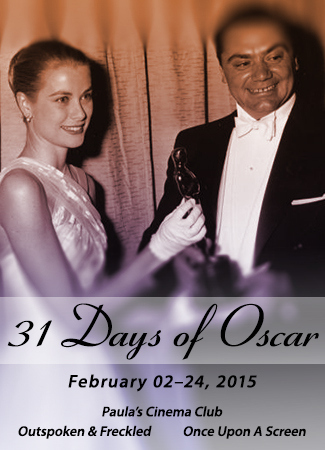 This post was a contribution to the 31 DAYS OF OSCAR BLOGATHON month-long celebration in coordination with TCM, hosted by Aurora of ONCE UPON A SCREEN, Paula of PAULA’S CINEMA CLUB, and Kellee of OUTSPOKEN & FRECKLED. Well done! Holden’s combination of appeal and talent is displayed beautifully in “Stalag 17”. A performance that never wears out its welcome. What a splendid tribute to that lovable cad, Bill Holden. I’m a huge fan of his performance in STALAG 17 myself. (Wrote a post a while back for my Billy Wilder blogathon). Holden had some Hollywood heavy-weights as competitors for Oscar that year- but I think the Academy chose well. Thanks again for participating in our blogathon! Thanks! I agree, the category is a “who’s who” of classic Hollywood and while they all did great performances in those films, I feel like their best work was yet to come. Although Montgomery Clift is the exception, in my opinion he was the only real competition. Too bad there aren’t two winners! Wonderful post here! I must say, personally, I prefer Sunset Blvd and wish he had won for that film. But you’ve made me really appreciate his performance in this film and I can’t wait to revisit it. Thanks Diana, it was a great text to read! I’m now in a William Holden’s films marathon so since 2-3 weeks I’m watching many of his films. He is my 5th favourite actor and his performance in Stalag 17 was stunning! I think Sunset Blvd is a better *movie* than Stalag 17, and I’ve seen it more often. But there’s no disputing that Holden was terrific as Sefton. I also loved his final anti hero role, also nominated, as the completely defeated executive in Network. He made these inherently unsavory characters so relate-able. Thank you so much for your comment! I love him in Network! The scene where he leaves Faye Dunaway is incredible! There’s no one else quite like Holden, and this is a wonderful tribute to him. STALAG is one of my favourites, although I’m also a fan of The Wild Bunch and Sabrina, despite the age gap.I didn’t realise he wasn’t keen on taking the role, it would have been a lesser film without him! I had no idea Holden didn’t want to do this film. He is perfect in this role, as you pointed out. “Stalag 17” is a fascinating movie, made all the better by Holden’s presence. This post is a great tribute to his work in that film.